Last week, Lifehacker wrapped up their annual coolest cubicle contest. The workspace pictured to the left is not the winner of that contest, but this is the workspace I want. 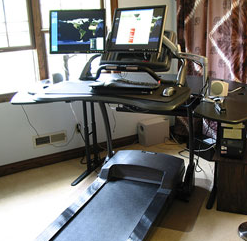 This guy rigged up his workspace atop a treadmill. Another guy did a similar thing. The thing about this setup, is you don’t have to set it to run very fast to have an impact. That picture below is little old me walking 1 mile per hour while blogging…at my desk. I’m there from 8:30am t 12:30pm, five day a week now. And, here’s the amazing thing…It doesn’t even feel like exercise! One mile per hour is the equivalent of a very slow walk. It’s slower than the pace I usually follow whenever I am on the phone (I have to move when I talk or feel like I’m gonna die). You don’t really get tired, you don’t sweat and, at my weight… By lunchtime, I’ve already burned around 600 friggin’ calories! The Cubicle of the Future?